Rock ‘n’ roll, even today to an extent but certainly for most of its first three or four decades, was viewed contemptuously by those outside of its circle. We know all of the criticisms by heart – it’s vulgar, cheap, exploitative, amateurish non-musical noise, cannibalistic jungle-music, take your pick, there’s plenty of crass and colorful put-downs to choose from. Most of these are elitist, quite often racist, certainly snobbish and almost always rooted in generational and cultural differences that seem insurmountable and often say more about those leveling the criticism than it does the music they’re targeting. Sidestepping those unfortunate aspects though, even while acknowledging the biases behind the furor of those criticisms, the gist of the most vociferous complaints always seem to focus on it being music that simply isn’t as professional, as polished… as good as the dominant pop music it replaced. An unshakable belief that the execution of the material is inherently sloppy, unsophisticated and crude and therefore it can’t possibly equal, let alone surpass, the higher standards pop music holds itself to. In some ways they have a point. Rock ‘n’ roll’s core appeal was that it was music intended for the house parties, seedy dives and – as Amos Milburn himself declared last time out – the chicken shacks. To be part of that environment and share its perspectives meant you understood the desire to celebrate them for the vibrant scenes they were… a life which the mainstream music and its listeners never knew, never WANTED to know or even acknowledge. To connect with the audience who were immersed in that world it meant this upstart music wasn’t going to aspire to impress the white adult supper club crowd at the same time. Rock wasn’t made for them, it didn’t need their approval and only when it started to pull in a wider audience over time, including the teenage children of many of those middle-class white adults, did the attacks really begin in earnest and then, in a beautifully ironic twist, rock brilliantly used that criticism to only increase the allure of the music to pull in even more listeners who wanted to distance themselves from the expectations of the repressed mainstream tastes of their elders. So what does all this mean now for Amos Milburn with the staggering success of his recently released Chicken Shack Boogie, a genre defining manifesto on rock’s cultural place in the world if there ever was one, gritty and greasy and unapologetic about it in every way. Hasn’t he proven he’s above the catcalls and disparaging remarks about his chosen occupation as a rocker? Of course, but it does help to have a chance to extend a middle finger to those putting down the music from their lofty perch in the balcony and Bewildered was heaven sent to do just that because it was not only taken from the cultured environment the mainstream elites fiercely guarded, but in fact was made demonstrably better by the rock artist, to the point where ever since the defining version has been that of Amos Milburn. The song was originally recorded by Tommy Dorsey way back in 1938, which is about as far-removed from rock ‘n’ roll as you can get, musically and culturally. In fact Dorsey’s only other notable association with rock ‘n’ roll is the fact he and his brother Jimmy hosted the television show that Elvis Presley made his national debut on in 1956. Soon after both Jimmy and Tommy kicked the bucket, probably as a result of the shock of hearing rock music firsthand. It’s a wonder that didn’t happen eight years earlier though when Tommy heard what Amos Milburn had done to his song. In this instance he didn’t make it more rambunctious or crass or cacophonous, as you might expect (or fear if you were Dorsey and his ilk), but rather that Milburn made it so much more authentic. No, this isn’t merely a personal subjective view of the merits of rock ‘n’ roll over that milder brand of music which preceded it, but rather an objective analysis of the intent of the lyrics being delivered in a way to highlight that intent… something NO other version had been remotely close to doing effectively until Milburn came along. Amos Milburn didn’t choose to record this because he was any fan of Tommy Dorsey. He may have been for all I know, but that wasn’t why he cut this in the fall of 1948 at the same time he was opening the doors to the Chicken Shack and receiving his greatest acclaim, not to mention greatest sales, to date. This recording was brought about entirely by circumstance as The Red Miller Trio, a black group that sounded white, released their version of Bewildered at that time. It was, for all intent and purposes, a pure pop record, albeit one issued on the already strong independent Bullet label, one of the few indies who hadn’t been confined to mainly niche markets, as they’d had the biggest selling record of the previous year in any field with regional society band nobody Frances Craig’s Near You. Now with Miller they seemed poised to have similar success with an artist who, like Craig, also seemed an unlikely candidate for such widespread attention. When Miller’s Bewildered began making noise, as was the standard operating procedure in this era, everybody rushed to cover it. 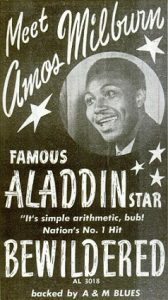 Although Miller’s song was connecting strongly with black listeners (it’d soon top Cash Box’s black record charts in Chicago) Aladdin Records knew they had an artist in Amos Milburn who was not only perfectly suited for this type of song, but whose style was much more in line with the tastes of the dominant black music fan of the day. In other words, the song was a low hanging fruit just begging to be plucked from the tree and bitten into. Amos Milburn was touring at the time and was in Chicago, not in Los Angeles where he normally recorded. No matter, he went into a Chicago studio on October 15th and recorded it there along with something to use as the B-side, the hastily written A&M Blues. That’s it. No normal four song session here, this was clearly a rush job designed to get their cover version on the market as quickly as possible. But they were faced with a dilemma because Milburn’s Chicken Shack Boogie was climbing the charts, giving him his first widespread national exposure at last, validating all of the deservedly high hopes the label had for him. 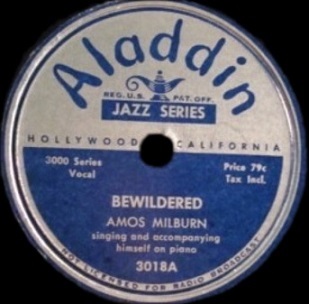 They held off releasing Bewildered for as long as they deemed prudent but then as Miller’s record grew ever more popular they had no choice but to put out Milburn’s and let Amos chase Miller down like overmatched prey. Amos Milburn lays waste to the idea that rock ‘n’ roll wasn’t as technically proficient, or worse, that it was musically unsophisticated or conceptually ineffective compared to the mannered pop of the day as Bewildered exposed that belief for the lie that it was. To start with nobody in rock’s formative years was a more soulful vocalist than Amos Milburn. Though currently hot for a storming rocker in which his open-throated cries of exultation were heard pouring out of every juke joint across the country, Milburn had long since established his ability to make you swoon, ache and sympathize with him in matters of the heart. He not only sang in a melodious voice that dripped with warmth, but as an actor playing the parts the songs called for he was a master thespian. Each emotion required of him he hit with unerring accuracy, every underlying mood he conveyed as if offering up subtitles to the main action on the screen, and with each pause and every breath he seemed to give you a window to peer into his heart, mind and soul. His abilities in this regard are all the more pronounced when we compare his performance not just to the staid Red Miller performance, but ALL versions of this song that came along over the next few months. We’ll even leave out the pre-historic Tommy Dorsey record since that was another musical lifetime ago, but the list of big names who cut this at the same time as Milburn is a pretty impressive one and none of them sound as if they had any idea what they were doing when compared to the mighty Milburn. Billy Eckstine’s technical proficiency is on full-display in his rendition but he’s emotionally detached from its meaning in every way. He might as well be singing about a mannequin he passed in a store window, so artificial is his presentation. Hadda Brooks, a hip white chick who’d come closest of all Caucasians to informing the pre-rock world, sounds sleepy, perhaps half-drugged, almost in a trance as she inches along the melody and while she clearly is connecting to the sentiments properly for the most part, the arrangement is lacking any urgency to support her so she’s left to wander around in the dark, feeling her way along. As for the rendition turned in by the most acclaimed pre-rock black vocal group, The Ink Spots… as great as they once were, as important as their role in advancing the cause of black artists as stars, their sterilized overly mannered version only shows why they needed to be violently overthrown by rock ‘n’ roll and sacrificed on the alter of the musical gods if any progress was to be made. Theirs is the living embodiment of how white America systematically emasculated black male artists before rock stood up to the tyranny of Jim Crow mindsets and refused to have their true voices stifled. As for Miller’s efforts, the record which started all of this, well let’s just say they couldn’t be further apart in terms of what they offer. Miller’s is an impassive story with no personal investment conveyed in his stilted reading. You scarcely believe he even knew the girl who supposedly broke his heart by the sound of his flighty interpretation of the events. He sounds downright awkward and embarrassed to be voicing such revelations publicly and shies away from their deeper meaning so as to separate himself from the emotional implications the story suggests. Milburn’s Bewildered on the other hand is a heart-wrenching confession of despair delivered at 3AM after soaking his misery with alcohol and watching the world go by through a hazy mist of tears. When they talk about heartache in life it’s more often than not a colloquialism that’s a stand in for the literal definition of the word. Amos Milburn’s performance IS the literal definition of the word, as his heart absolutely aches in a way that physically hurts, and yet through the pain brought on by this break-up he manages to haltingly express his feelings in a way that is startlingly believable. Rush job though it might’ve been, Milburn sounds as if he had recently lived through the entire experience described in the lyrics, drawing out each refrain to its breaking point yet keeping it tethered, ever so tenuously, to the hope that always lies beyond tomorrow’s dawn. One thing was certain, no matter who else ever tried their hand at it, nobody would be able to match Milburn’s emotional commitment to the song. Musically it’s equally stellar. Whether they flew Maxwell Davis in from L.A. to produce and back Milburn on it or not, I’m not sure, but the saxophone has all the hallmarks of Davis’s understated mastery, a languid tone that adds to the despondent atmosphere. In a year that was defined by the saxophone, though usually in much more flamboyant ways than heard here, this just might be the most effective use of the instrument we’ve yet come across. All that might be expected – which shows just how high a standard Milburn and company have set thus far – but what’s completely out of character is the guitar solo that follows, playing taut lines which add a different feel, a little more vibrant yet not detracting in any way from the overriding mood, and offering a far more varied texture than we’re used to, not only with Milburn but all of rock to this point. Though slightly more jazzy than will take hold in the coming months as more rock artists come along wielding guitars, it’s perfectly suited for this specific milieu they place us in. When Milburn comes back in for the coda you are absolutely transfixed, like a spell that holds you in thrall, albeit willingly and without any resistance. The entire performance it seems takes place in a dreamy subconscious that exists just before waking, one which in many ways is more lifelike than life itself… where every emotion is more deeply felt, every image more sharply focused, every moment more fully realized. All of that combines to make Bewildered one record that not only lives up to its reputation but far surpasses it, one of the few that can be said to be truly flawless in every conceivable way. 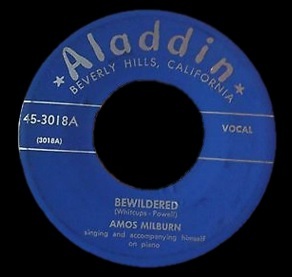 Aladdin had no choice but to put this out on the heels of his breakthrough and greatest artistic achievement to date and they were rewarded for it, as Bewildered quickly caught and surpassed Miller’s mild rendition on the charts and became Milburn’s second #1 hit in as many releases, cementing his status as one of rock’s biggest stars and most talented artists. That the two records have such divergent attitudes, not to mention deliveries and musical structure, only shows that Milburn, and rock itself for that matter, were far more diverse than critics would claim, ensuring they were poised to make even bigger inroads into the mainstream with a growing arsenal of artistic weapons at their disposal. For the first, but hardly the last, time in its lifetime rock ‘n’ roll had delivered the definitive take on a record that the pop world had previously claimed for itself. With that sudden artistic and commercial takeover – a previously inconceivable thought among the musical and cultural elite – the walls of the city which were holding back the growing tide of musical revolution began to crack and soon would come tumbling down, leaving the established vanguard bewildered as to just how their grip on the nation’s ears slipped away forever. Listening to prior versions reveal that Amos’ primary achievement is actually sounding bewildered. He definitely earned a “10” with this performance. For me, only James Brown’s version is better (also a “10”). On a related note, I’m surprised at how unemotional the Ink Spots’ version is. Sure, they were never as passionate as the rock groups they influenced, but they were generally more heartfelt than their contemporaries on their best songs. On “Bewildered” though, Bill Kenny just sounds so unwilling to bear his heart (or even admit he experiences emotions). That’s what I tried conveying in the comment about white America’s emasculation of black artists. It’s why the context of the entire era of rock is so important to understand and why I take so much time to try and focus on it in the reviews and the Monthly Overviews. Artists like The Ink Spots should be widely celebrated for their achievements, scoring pop hits in a segregated world was truly a remarkable feat considering the social landscape of the day. But to do so they needed to make huge concessions so as not to come across as threatening in ANY way (vocally, sexually, even just exhibiting too much natural emotion). Seeing the rapid change from that unfortunate reality to how rock flaunted that by unleashing those pent-up emotions establishes the larger underlying theme to all this. You can see why rock music stirred the passions of the younger audience and why in a few short years that kind of realism made the mannered pop seem hopelessly contrived so that even white kids who’d been taught to be dismissive of black America began to relate to it too, choosing to listen to their own emotional connection with what was being expressed more than listening to their parents and teachers condemning it. 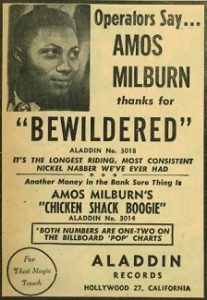 Leave a reply on "Amos Milburn: “Bewildered”"